Nearly 100 million years ago, two baby birds were trapped in the sticky sap of a tropical forest tree. Now, their wings, entombed in amber, are giving scientists fresh insights into the evolution of birds. The tiny specimens were found in the Hukawng Valley in northern Myanmar and described in the journal Nature Communications. This is the first time wings have been found encased in amber. Individual feathers or fragments of feathers are found frequently. The samples contain two impeccably preserved wing tips with all features intact, including soft tissue, from two birds that scientists believe were hatched nearly 100 million years ago during the Cretaceous period, about 45 million years after the first birds, or avian dinosaurs, evolved. Each fragment is only a few centimeters in length and probably belonged to enantiornithines, a group of toothed birds. The size and skeletal development of the wings suggest the birds were juveniles when they became trapped in sap, according to the study's co-author Xing Lida of the China University of Geosciences. All previous studies of Cretaceous birds have been based on fossils－compressed, two-dimensional remains preserved in sedimentary rock. 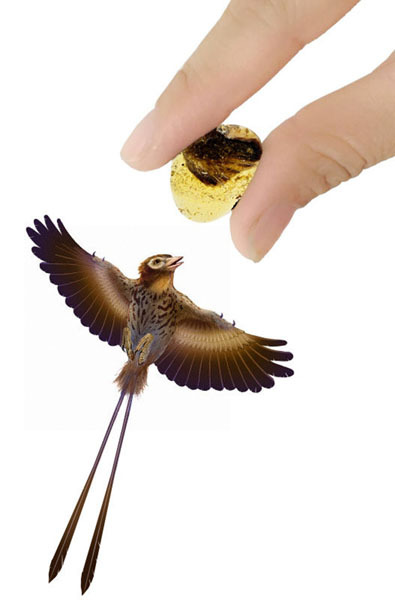 "The amber specimens offer an one-of-a-kind chance for us to see extinct, toothed birds in the most true-to-life way," Xing said. "It's just overwhelming." Nearly 100 million years ago, two baby birds were trapped in the sticky sap of a tropical forest tree. Now, their wings, entombed in amber, are giving scientists fresh insights into the evolution of birds.